Last weekend started with too much tequila on Friday night, after Mark and I shared our last bottle with Scott and Melissa on SV Kaimana. Good times were had, leading to a few false starts – always ending back in bed - on Saturday. After a hearty lunch at 1pm, we felt ready to leave Fare and head back to peaceful Avea Bay on the SW side of Huahine for Mark’s birthday. The hope to sail there was abandoned after an hour of little progress, “shaking down” our sails and equipment, to make sure everything worked well, before our upcoming longish trip back to Tahiti. When we arrived in Avea, it was a nice surprise to find our friends Marie and JP on MV Domino in the bay. Having company on one’s birthday is always a bonus. We anchored Irie on the shallow 6ft sand back again, this time letting heaps of anchor chain out so we wouldn’t get in “trouble” when the wind and the current played tricky games with the boat. Just as our friends came by to say hello, we saw a big dark spot moving astern: manta rays! It didn’t take long for Marie, JP and me (after quickly putting the boat in order after our arrival) to jump in the water with our snorkel gear and spot two or three of the gentle giants feeding along the drop off. Mark had some Wirie work to do, since it was already 3:30pm and we had been “useless” earlier in the day. The following morning, on March 1st, I wished my husband a happy 44th birthday and made French toast with coconut bread. A yummy treat, but we had to refrain ourselves, since a massive Polynesian lunch was planned ashore. Around 11am, we joined Marie and JP at restaurant Chez Tara, with a whole bunch of other tourists and locals. Their special Sunday lunch was revealed, when all the food – that had cooked for hours in an umu (underground “dirt oven”) – surfaced in a big metal cage. As dish after dish was uncovered, tourists stood by and took photos. Everything was transferred to a buffet table, where it was served to all people present. Our plates loaded up with traditional Polynesian food, like tender pork, pork with spinach, smoked veal, fish, taro, breadfruit, purple bananas, poisson cru, mushy bread, clams, and many other non-pronounceable or non-translatable dishes, we returned to our tables to enjoy the “heavy” feast. Our bellies were too full to indulge in the four different kinds (and colors) of the traditional po’e po’e dessert (a sweet, pudding-like dish made with bananas, papaya, or mangoes cooked with taro and coconut cream). Two ukulele players provided musical ambiance and we had a very pleasant time and experience, topped off by a wonderful gift from Marie, who had made a beautiful nautical quilt for Mark. Exhausted from the heat, bountiful food and sleepless nights, we took it easy the rest of the day – a lazy Sunday afternoon with no internet! Monday started quite differently. As soon as the sun was up, I hauled Mark up the mast to fix a small issue with the flag halyard. Then, we both jumped into the shallow, clear water to clean Irie’s bottom. Keeping ourselves afloat next to the boat proved to an exhausting affair, with the wind and current sending Irie all over the place! After this two hour long exercise and some work online, we decided to head back to Fare, close to the pass, in case we would leave for Tahiti the very same day. The motor trip along the coast was quite brutal with a massive squall, choppy lagoon and buckets of rain. Drenched to the bone, we picked up a mooring ball off the beach and took a breather. On Tuesday morning, the wind shifted to what was predicted and a quick and pleasant three hour sail concluded our last Irie journey to Tahiti. 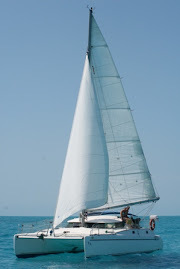 Initially planning to go to the Arue Yacht Club – our preferred option – this angle was impossible to sail, so we diverted to the Marina Taina anchorage, where we settled – far enough away from all neighbors, in deep water – around 11 am. With the funky winds, constant waves from ocean swell and boat traffic, the incessant heat, and suffocating smoke from burning garbage, busy Tahiti is a necessary evil for the sailor needing services in regards to health, shopping and boat maintenance. Welcome to paradise! Let’s hope we don’t have to stay long after Mark’s check-up on March 9th. And the view of the bay and Raiatea during the day - Huahine is pretty! The umu, or underground oven, takes a couple of hours to prepare and is covered with banana leaves and dirt. Then, the food cooks for 4-5 hours. ... and devoured as firsts and seconds!